Rare and Fine Japanese Edo Period Musha Ningyo for the Boy's Day display, depicting the celebrated tea master and political adviser Sen no Rikyu (1522-1591), in a kneeling position wearing rich silk brocades. He is displayed in front of a beautiful and elegant wood and silk screen with four continuing panels of a dragon flying in the clouds and chasing the magic pearl of immortality. The screen is made of black lacquered wood with gilt threads couched and stumpworked onto a dark black silk background. 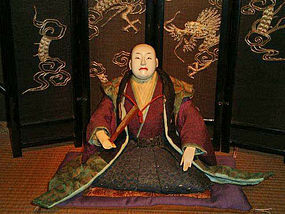 Ningyo depicting Sen no Rikyu became popular in the opening decades of the 19th century when stories, plays, and ningyo connected with the life of Toyotomi Hideyoshi (to whom Rikyu served as an important advisor) dominated many aspects of popular culture. Minor wear to black velvet collar, otherwise fine condition. Screen: 18 x 12.5 inches, 46 x 32 cm. Ningyo height: 8.5 inches, 21.5 cm. 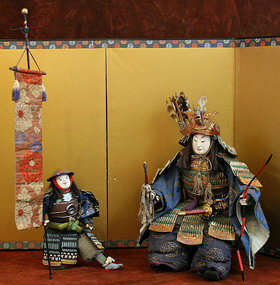 Japanese Edo Period Musha Ningyo (Boys Day) Dolls, Samurai Set. Ningyo this early almost never appear for sale, much less with accessories, as we have here with this very fine quality pair. They have finely carved faces, and are lacquered with many coats of gofun (white oyster shell pigment). 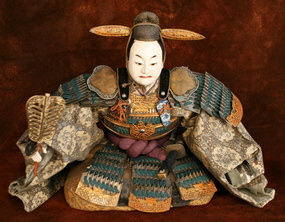 They are adorned with sumptuous silk brocades and silk armor, indicative of Edo Period Ningyo artistry. Tallest Ningyo: 19 inches (48.25cm). 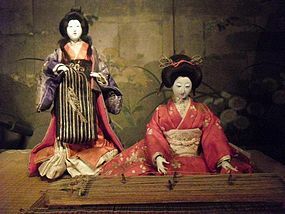 A 19th Century Isho Ningyo set of two Geisha entertainers, one a Koto Player, the other the highest ranking Orian singing. They are of the finest quality. 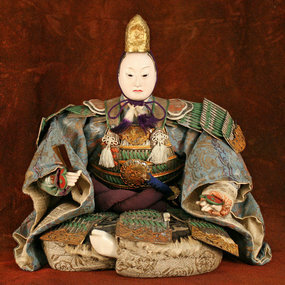 They have beautifully carved faces and hands, and wear gorgeous, sumptuous brocades with fantastic embroidery. The Orian has fine embroidery of a carp ascending a waterfall, a crane, and turtles on waves. The Koto Player has embroidery of cherry blossoms and patterns of gold threads. The Koto is made of paloma wood, teak, and ivory. Geisha means 'woman of art'. The art may be shamisen playing, singing, dancing, and of course, the arts of conversation and tea ceremony hostess. 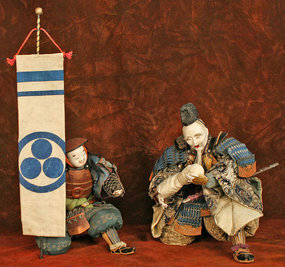 Sizes: Orian 11.75 inches (30cm) high; Koto Player 7.75 inches (20cm) high; Koto 12 inches (30.5cm) wide. 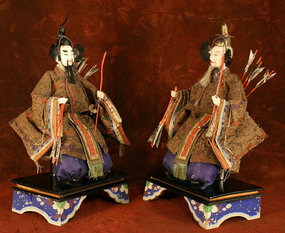 Japanese Edo Period Rare Large Pair of Girl's Day Festival Palace Guardians. They have all of their accessories and they are presented on wonderful stands. Their faces are carved of wood with amazing features. An extraordinary work of Ningyo Artistry. Height: 18 inches, 46 cm. A wonderful 19th Century Boy's Day Ningyo of a boy dressed as a Samurai in full armor, featuring a dragon, sword, helmet, and bow and arrows. His wonderful face is carved of wood and covered with many layers of Gofun (oyster sell lacquer). 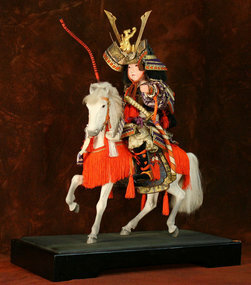 He is riding a battle horse in full dress, all creating a spectacular work of art. The original wood box is included. Height: 23 inches (58.5cm), width: 18 inches (46cm). Late Edo Period Musha Ningyo of Minamoto no Yoshitsune. This wonderful example of high quality has an extraordinary presence, sumptuous brocades, gold lacquered armor, a spectacular helmet, and many other fine details. His face is gorgeously and masterfully carved with finely burnished gofun. Figure height: 20 inches (51cm), with arrows: 25 inches (63.5 cm). Excellent Condition. 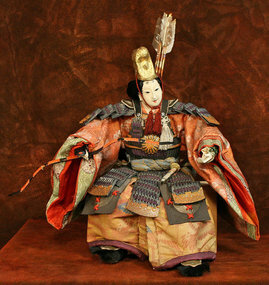 A wonderful and rare late Edo Period Musha Ningyo (Warrior doll or Boy's Day doll) of a seated Empress Warrior Jingu. She has an unusual and striking presence. She is seated (most are standing), and she has all her accessories, wearing sumptuous silk brocade textiles. She has a beautifully carved face and hands of varnished gofun. 20 inches (51cm) high and 16 inches (40.5 cm) wide. Rare and Spectacular Edo Period Musha Ningyo of Toyotomi Hideyoshi (circa 1780). 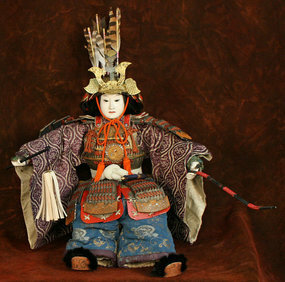 A musha ningyo (Warrior doll or Boy's Day doll) modeled after the seated Toyotomi Hideyoshi in armor with an eboshi winged hat and a sword, holding a gunbai-uchiwa (military fan). This is the first one found by the same maker as the Hideyoshi in the famed Ayervais collection (cf. "Ningyo, the Art of the Human Figurine " Japan Society 1995 page 34, and "Ningyo, the Art of the Japanese Doll" by Alan Pate published by Tuttle. Exhibitions: Japan Society 1995, Metropolitan Museum 2001, Mingei Museum 2005.) This Musha Ningyo of Toyotomi Hideyoshi is considered the finest quality example from the Edo Period, and is in fine condition. Incredibly carved face covered in many layers of varnished gofun. Wearing sumptuous silk brocades. Toyotomi Hideyoshi (1537-1598) unified Japan after the Muromachi government lost control. The period of his rule, Momoyama is named after Hideyoshi's castle. 14h x 15w inches, 35.5h x 38w cm. 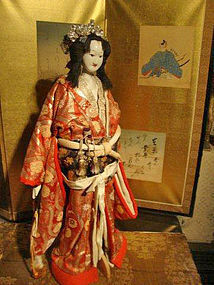 Fine Late 19th Century Bunraku Puppet of a Sambaso Dancer. 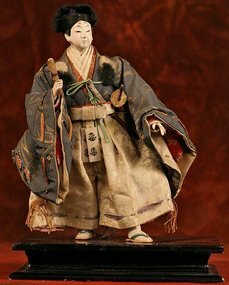 This rare Bunraku puppet is operated by three Puppet Masters, who make it come to life to present a magical theatrical experience. He is carved of wood and covered with Gofun. He wears a beautiful Robin egg blue and Saffron orange robes. His head is adorned with a silver and black hat featuring a rising sun. He is holding bells and a fan. 24.5 inches, 62cm.